I haven’t been Walgreening much lately, but I had a $3 Register Reward to use so I stopped by while my husband was in town for the weekend and picked up a few deals. Total OOP: $.42! and received $2 RR’s! I was hoping they would have had some Huggies Wipes in stock by now, but alas, there were none. I have yet to take advantage of this deal so I hope to luck out and make it to one right after they restock. Maybe tomorrow! Also, if you have a sweet tooth for good chocolate: I saw the Green & Black Organics Toffee chocolate bars were clearanced to $1.87. Laurie – I just visited the Vocalpoint website to sign up, only to discover I already had, last October. I never get anything in the mail, any suggestions? Jamie– vocalpoint will send you coupons in the mail, every month or two. There is almost always a "free" coupon for you, and 4 or 5 high value coupons "to share". 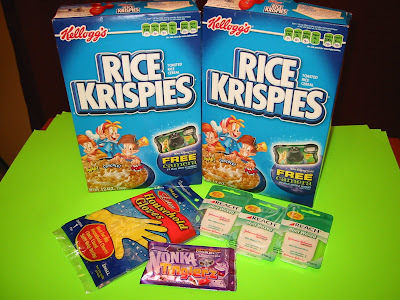 In the last month I received the Rice Crispy Coupons, as well as some Bounce dryer bar coupons. It's definitely an awesome program! I just joined Vocalpoint. . . but how does it work with getting the coupons? hey guys! I just heard at "hip to save" that the code for the free collage print is working already (it should work till the 26th). MLK & Broadway has tons of wipes, but they are $3.99! Not a good deal.